Well my old pair of Yamaha speakers and subwoofer that had served me well for 10 years finally gave up the ghost shortly after Christmas. 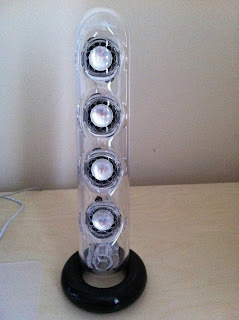 Looking around for a replacement I remember seeing the see-through Harman Soundsticks II a while back in the Apple Store in Regent Street. I decided to use some of the Christmas money I had to buy a pair but they have been upgraded and improved since I saw them and are now the Soundsticks III. As far as the sound they produce, I can only say WOW! 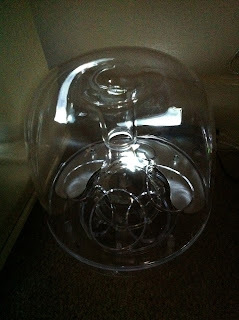 The subwoofer pumps out an incredible amount of bass which can be turned down if you don't like the idea of the sound almost passing through your entire body. The smaller pair of speakers sit happily on your desk next to your Mac (surely you don't use a PC) and one has a touch sensitive volume control. I am very pleased I got them and the see-through industrial design really does go well with my Mac. The bright white LED light on the subwoofer puts the finishing touches to a very well made and desirable set up.